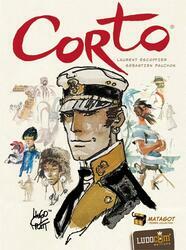 Enter the romantic and magical universe of Corto Maltese, the hero created by Hugo Pratt. Choose your adventures and live them simultaneously. With the support of Corto and despite the interventions of Rasputin, form groups of adventurers and grab the gold of the different quests! Corto is a game of adventure and maps, mixing tactics and chance. For each game, choose the quests in play; they bring each their own lot of characters and specificities (attack of the Russian gold train, search for the four aces in whalebone, meeting with the leopard-men ...). Thus the parts are varied, and rich in action, twists and, of course, in treasure!